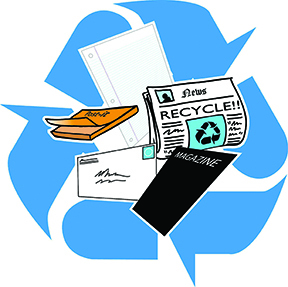 Paper recycling is more than just putting used paper in an appropriately-labeled recycling bin. Rather, it is an entire process that includes collecting, sorting, shipping, manufacturing, and purchasing the newly-made products in a repeatable cycle. Whether paper is made from trees, crops, agricultural residue, or other fibers, a recycling system is needed to promote environmental sustainability. A surprisingly large number of products can be made from recycled materials: fine writing and printing papers; newspapers and magazines; household paper products like paper towels, napkins, facial and toilet tissue; office products like copy paper, file folders, envelopes, and adding machine tape; packaging products like cereal packages, egg cartons, gift boxes, and cardboard boxes; game boards; animal bedding; and insulation. Click to download the June 2015 Printips newsletter.